Fans who grew up with Batman: The Animated Series as their go-to cartoon superhero show have undoubtedly noticed the darker, more violent trend in those same cartoons now. I don’t think this is bad or even unwanted, as you can tell from my review of this month’s Batman vs. Robin. But a return to a more traditional, 90s feel is certainly welcome. That’s what we get in Batman Unlimited: Animal Instincts. The story brings together classic Batman foes and heroes to uncover the plot behind Penguin’s new invention of Cyber Animals. 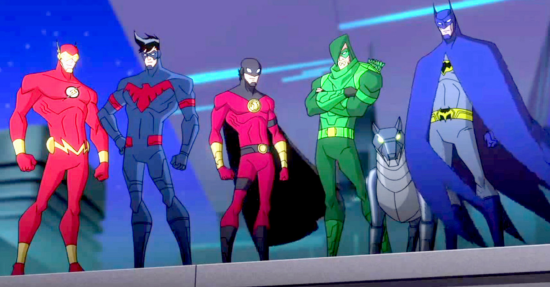 The robotic creatures keep popping up during strange crimes committed by the Animilitia, a squad of animal-inspired villains that includes Silverback, Cheetah, Killer Croc and Man-Bat. Luckily, Batman has his own squad to call on and Flash, Green Arrow, Nightwing and Red Robin answer. Animal Instincts comes straight out of DC Entertainment’s desire to create a Batman animated film for younger kids. That sentiment registered strongly with screenwriter Heath Corson who “wanted to capture that fun of Silver Age Justice League comics.” He’s definitely done that here. Humor is used to great effect and is mixed effortlessly with both hand-to-hand and high speed action scenes. Fight sequences are often one-on-one giving each hero and villain a chance in the spotlight.